Well as they say on a fishing holiday the last day comes way to fast and on Johns last day the boys had decided to fish till they dropped. The start of the day was at 7 mile in the dark for a tarpon some guys want tarpon every day but Johns guys just liked catching fish and yes a 4 am start does tend to screw up the rest of the day. Well we were first boat but I was surprised to see three other boats all before light one nearer Marathon hooked up and the boat near us jumped two so the fish were there. We missed two bites and as day light came we all thought it was not going to be are morning not the start we had all wanted. Then I noticed Johns balloon going under and as is often the case after a lull John did not see it. Aperently I shounted wind you ***** I know it does not sound like me but it worked and fish on. No tarpon jump but this very strong fish was going through the bridges so anchor off and off we went and boy this fish was pulling line. The one and only by catch we get using crab is permit and they are always big ones as they go between the bridges to get to flats and yes I called this one right. It took some time and made some very strong runs to straight at the concrete piles but at last it was in the net. 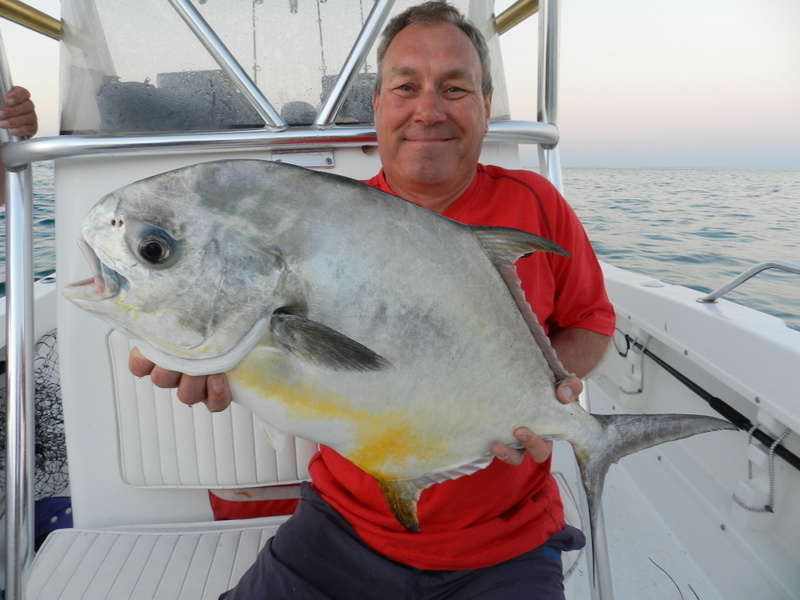 In fact a big permit is often on the top off guys wish list when they come to the Florida Keys so to get one as a buy catch you are very lucky. It wont be very long till we are targeting these fish as they spawn on the wrecks and if this year is half as good as last there will be a lot of very happy anglers. At last after what seems ages we were able to go deep offshore in search of one of our favorite fish the dorado. 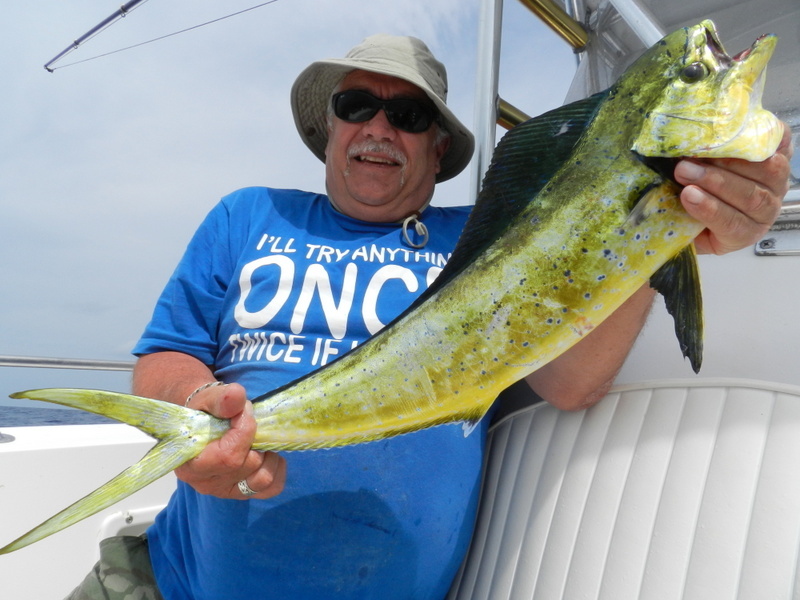 This fish is also called mahi mahi but known locally as dolphin fish this always causes much fun at local restaurant’s when first timers to the Florida Keys see local dolphin on the menu. The colours on a fresh out of the water fish are just amazing you have to see one as no photo ever does this fish any justice. We only found fish in some 600 ft of water nearly 20 miles off shore but when the lines pull out of the clips and the shout fish on it does not get any better. You can see how it got its Spanish name dorado some fish even have gold spots on their sides. What an amazing short life these fish have they only live to 3 to 4 years old and grow like no other fish in the world. At a local university they recently found a 39 lb fish was not yet a year old. They even reach maturity at 3 months old and can spawn up yo three times a year having up to 1 million eggs. Don’t you all wish that our UK bass had even half of these numbers they still have a size limit and a bag limit. My best comet by an angler on a fishing holiday was you have screwed my fly fishing back home for ever seeing 20 + fish of all colours cashing my fly will stick in my mind for ever. 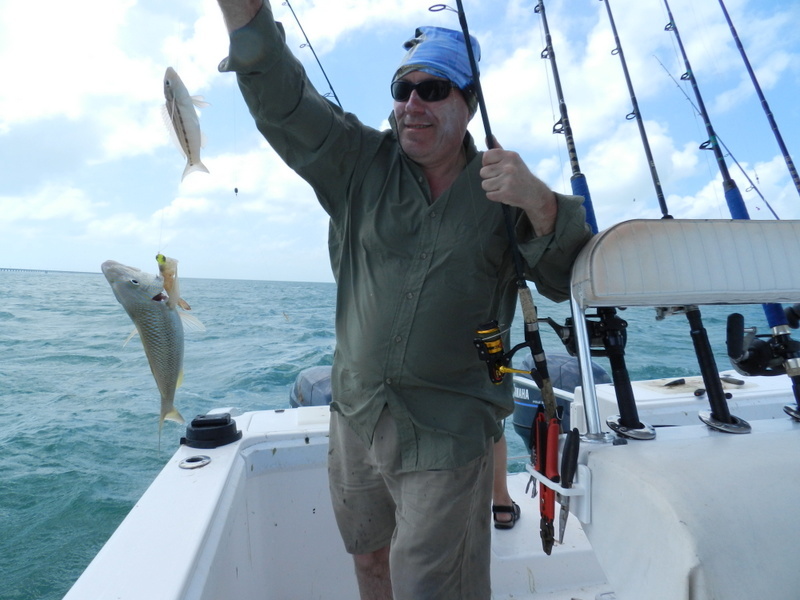 Most days fishing in the Florida Keys are good some are very good then you have days like yesterday just off the chart. 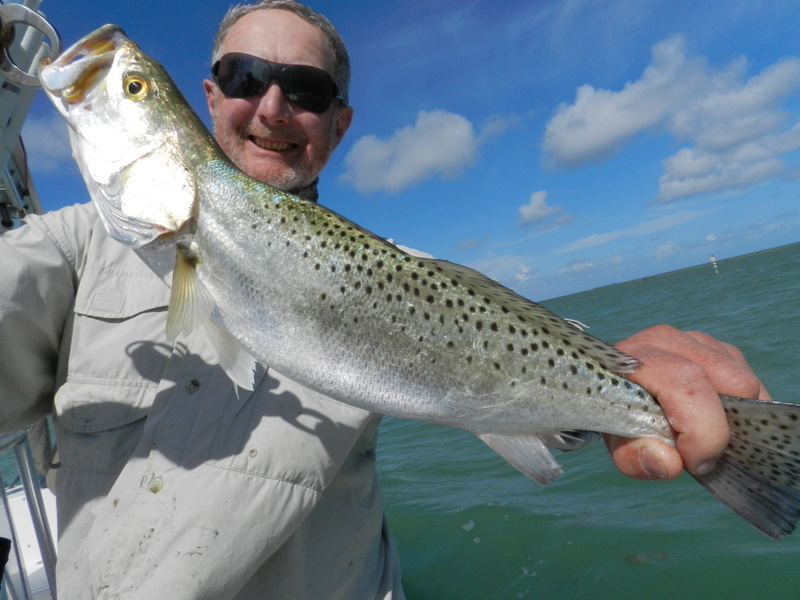 I have been guiding now for over 8 years and fishing in the keys for over 12 and I like to think I am doing a good job but when a well seasoned angler on one of our fishing holidays tells you he has just had his best days fishing ever had it makes it all worth while. We had an early start you have to be first boat on these wrecks in the Gulf they only fish one boat and it is first come first gets it so it is always good after a long run not to see an other boat. With at last light winds and wind with tide it was game on two guys wanted a big grouper so are normal approach was sett up. I am still indebted to Jim Whippy who developed the Whippy walk dragging these monsters out of the wreck as normal pump and wind will just not work. 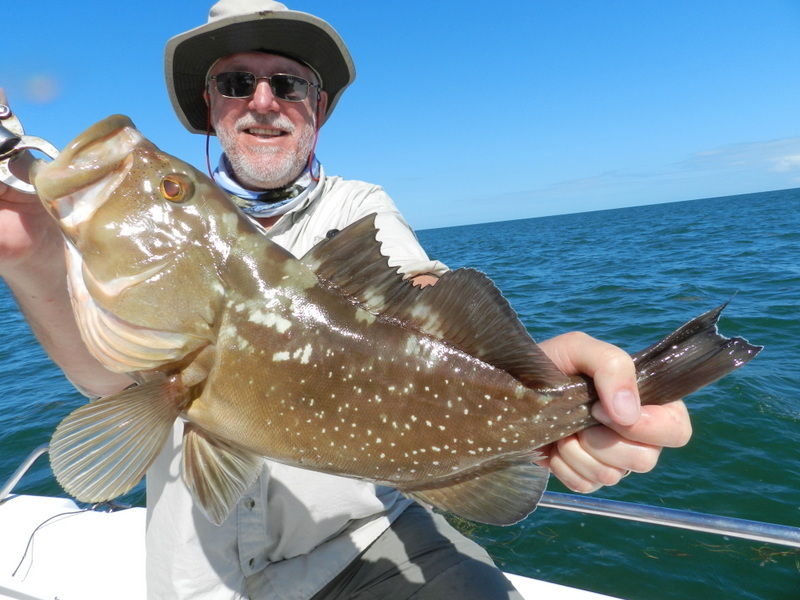 Well two grouper over 200 lb and one very near 300 lb the day was going to plan and a very sporty one near 50 on a ledger rod. The ledger rod went off again but this fish was screaming line and 50 lb braid just flying off the reel. 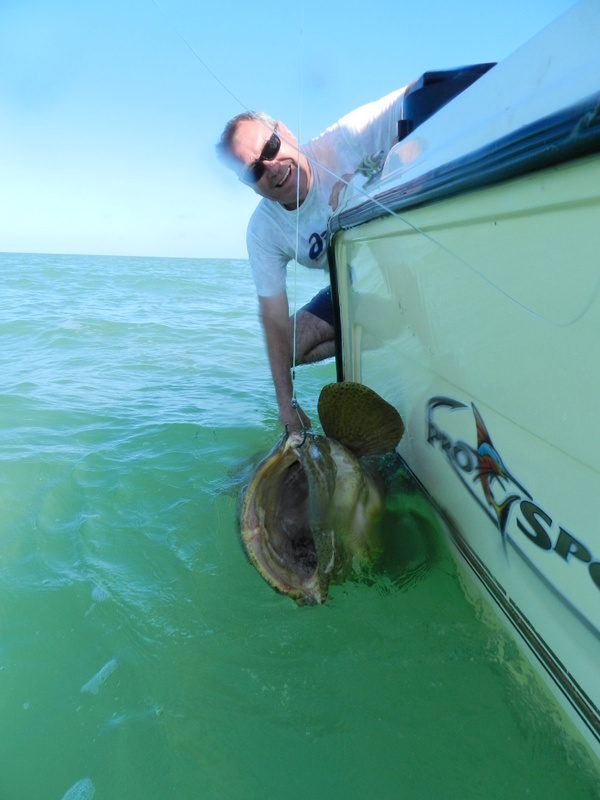 No grouper and I call this one right again a very big and energetic stingray the runs these fish make are amazing. This fish tipped the scales near 75 lb every so often I keep just one for bait and one like this will keep me going in shark bait for a long time. It makes me laugh to see the sting ray barbs in some hammerhead as it is their favorite food by far and was the bait used to take our 1000lb + fish a few years ago. 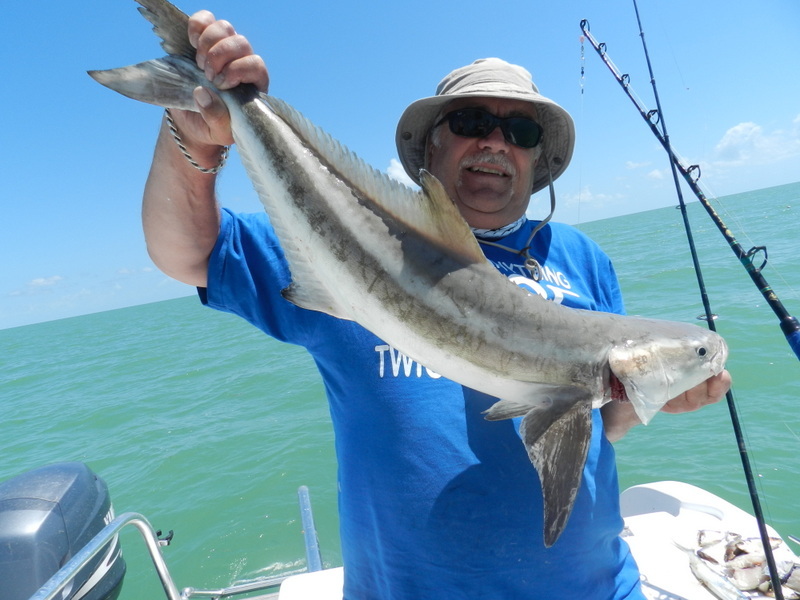 Next up was a nice cobia for Ian the take on the top was more like an explosion that a take just stunning. Towards the end of the day the boat was just surround by sporty shark fish up to 50 lb so many we were able to just freeline baits, as good as it gets. So after a long hot day back home with three very happy and very tired anglers who remember that day for a very long time. Still to windy to enjoy a day offshore so we have been having a blast backcountry in the thousands of square miles of Florida Bay. The one thing Johns party this week have got so right is to enjoy what you can and match the hatch with the catch. Some of the best trout fishing I have ever known and on the popping cork or jig action all the time. 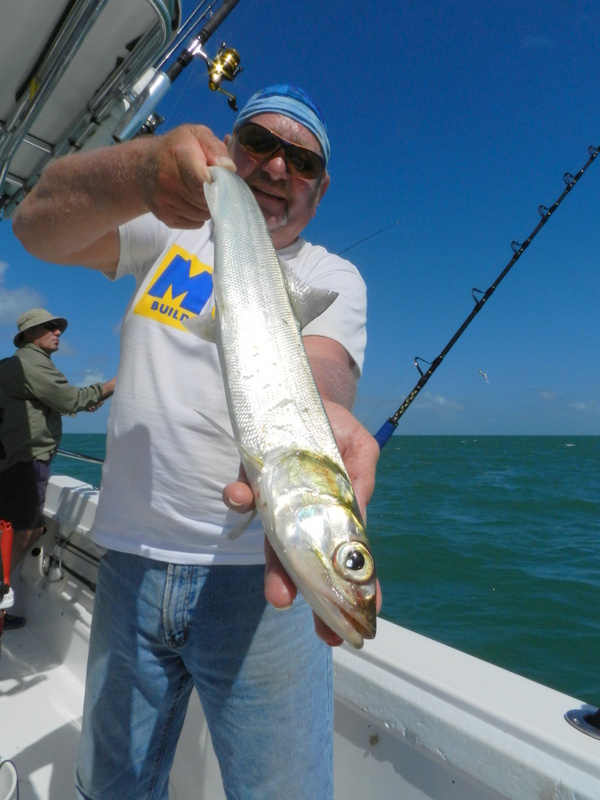 Mix into the mix the acrobatic ladyfish which is also known as the poor mans tarpon fun all day. Snapper fishing backcountry also on fire plenty of good keeper fish to enjoy later in the day just so much fun watching anglers trying to get the hooks out and find out just why they are called snapper. Once those two fangs are in your fingers they just won’t let go I know many years ago I had one stuck on my face after giving it the Rex kiss good bye my wife laughed till it hurt. On the way back a couple of drifts over our favorite grouper wreck and a nice 100 lb + grouper for one of the guys who are planing a full day on the wreck today. At last at what has seemed for ever the winds are backing off yesterday plans were to see if we could get to our trout island. As it was still blowing near 20 and after a very wet night yes it does rain in the Florida Keys we tried to creep round the flats to get there. A few stops on the way on normally good trout areas but no luck but at last stop before the islands it was game on. 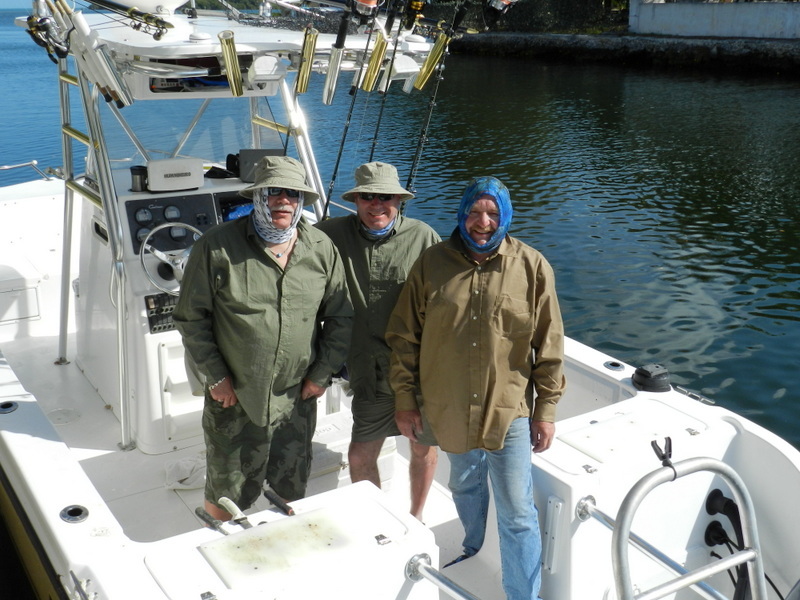 We started off with big keeper snapper, trout , ladyfish and jacks just the tonic Johns guys needed. But as are luck would have it the tide died and then started to run against the wind not nice. 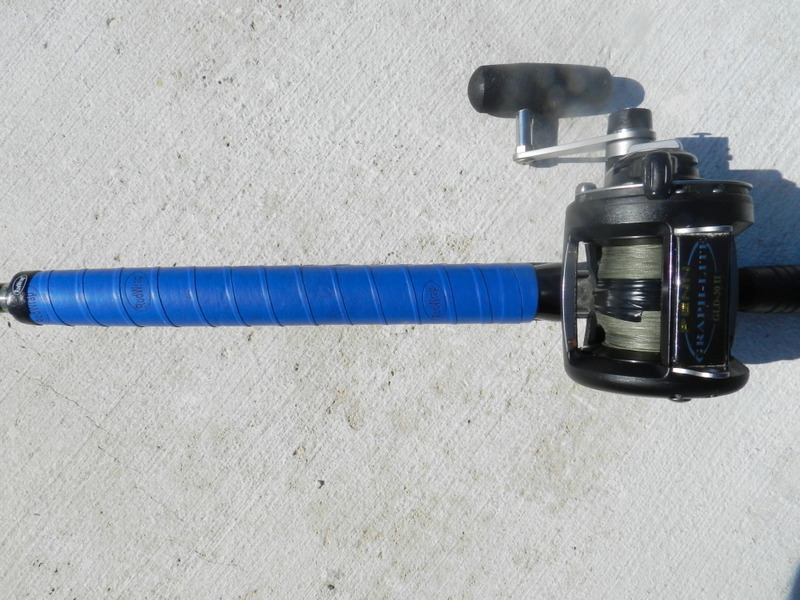 We still were catching and the run to the island would not be pretty so tough it out then the big shark rod went off. After many years of doing fishing holidays I can call most shark well before we see them and this was behaving like a big nurse. 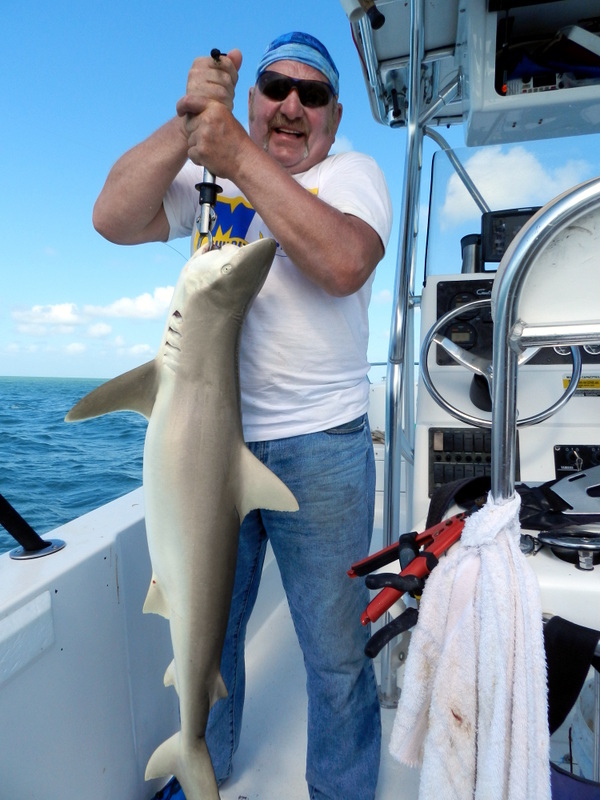 They are not the most sporting shark but some like this one don’t read the rule book. At the side of the boat and I don’t know why I say it I said the stupid words : How abut getting it in for a group photo : Well there is some thing in a big nurse sharks mind that says no and the battle starts. 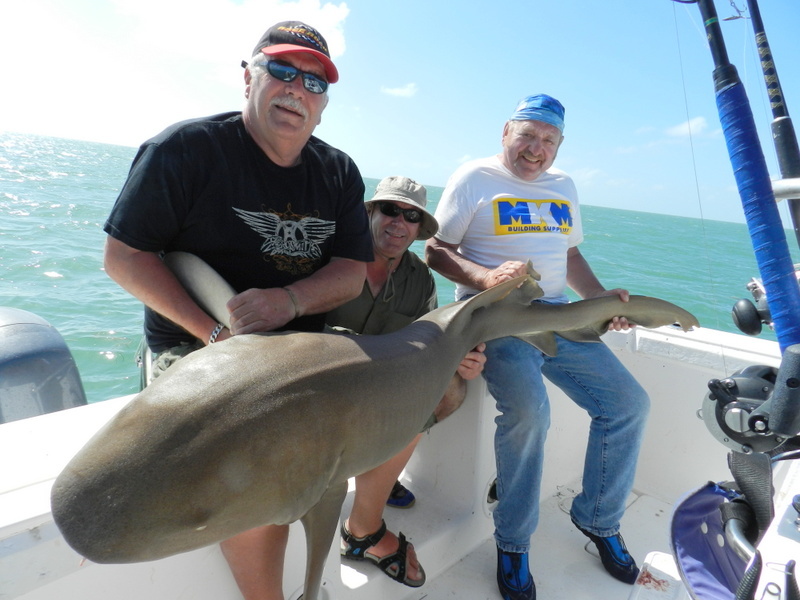 Well we won and that nice group photo with a 150 lb + shark will be a memory to last. 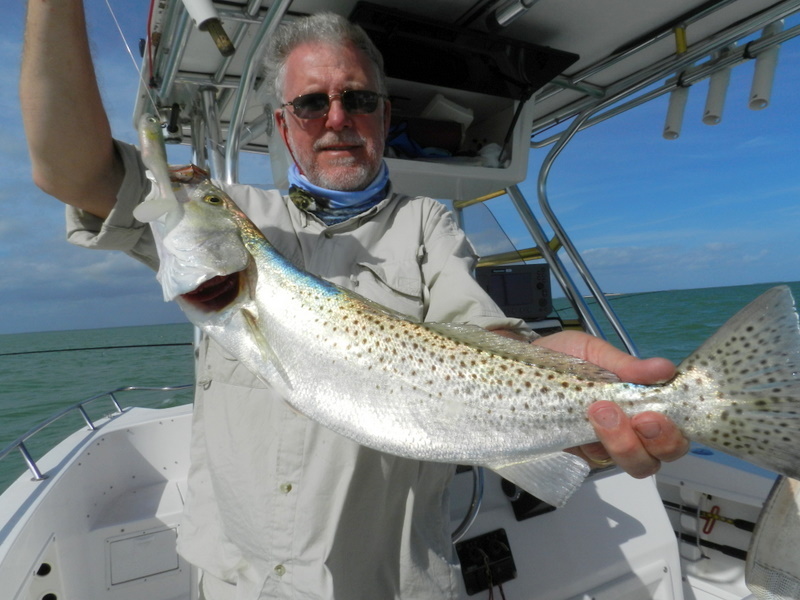 Fish kept coming and John had a very good trout on a live-bait so a plan did come together. 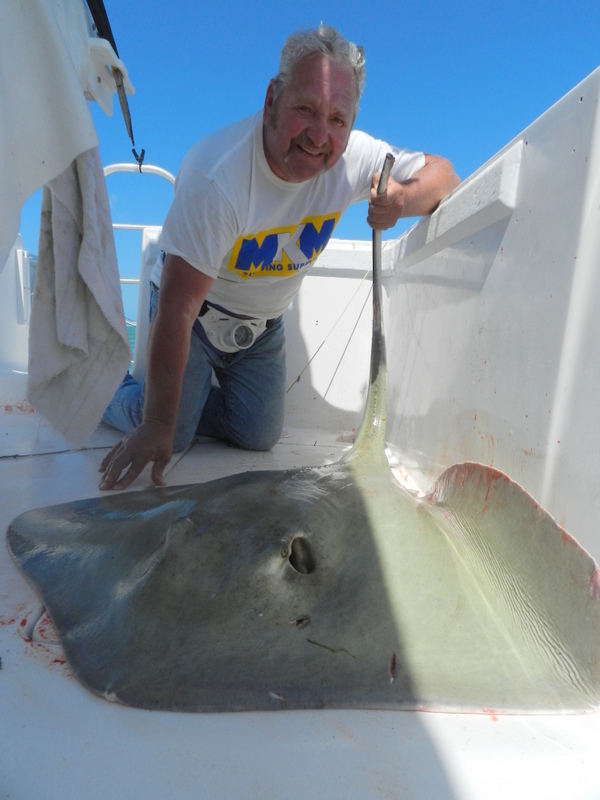 Maybe best fish of the day was a sporty shark to of well over 30 lb on the light rod. 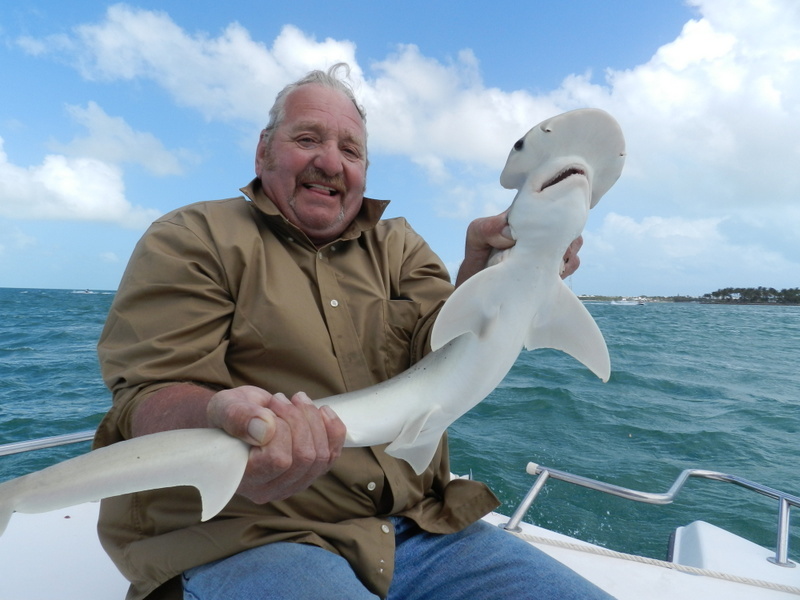 We have always called these shark as reef sharks as I was told by a guide many years ago but after showing pictures to people who know about shark and a lot of web browsing they are in fact blacknose shark. Not sure why but as they get older they lose their black nose but what I do know on light tackle they go like stink and as one guy said they make are tope seem very tame. 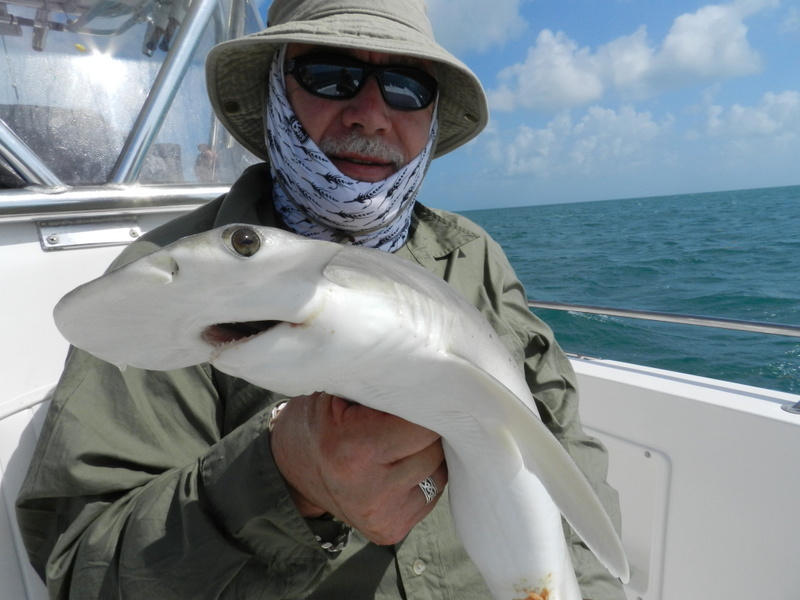 We have one shark out here in the Florida Keys called a bonnethead which often confuses new angler’s. It has a hammerhead type head but is not a baby hammerhead and only averages about 5 lb but as it says in my book a spunky little fighter. The wind is still blowing and we are having to find shelter and fish where we can at least we have a good forecast for the end of the week. We ended up over a small hole just yards offshore yesterday and found a load of bonnetheads. 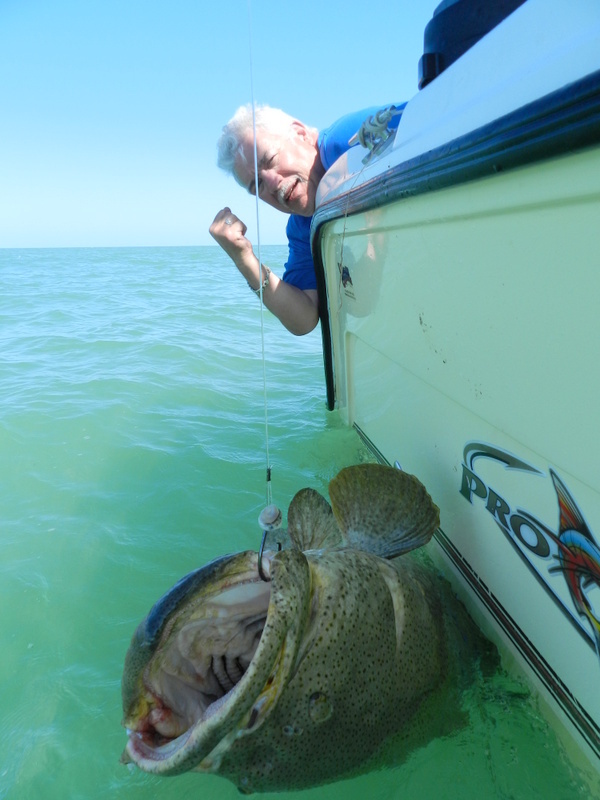 At least in the Florida Keys we can do this and these fish pull way above their weight and put some smiles back on the guys faces in less than nice conditions. Yesterday we had a first in over eight years of running fishing holidays we have never had two fish on and one not even on the hook. 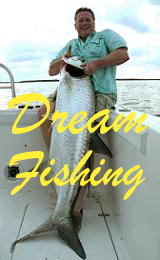 The poor sand perch had snared itself above the hook and the grunt was on the jig strange things happen at sea. It was also a new shirt day at the moment the sun is brutal and with the strong winds pale UK skin burns in minutes. The best way is just to cover the skin and the new face buffs do the job very well. The one thing Johns guys have got it right is to enjoy what you can you cant change the weather but you can make the most of what you can do well done. Just how big can you go ? I was talking to Capt Ron Mitchell last night about the upcoming season for him in the SKA and the new Snowbee rods when I was blown away with what he told me. 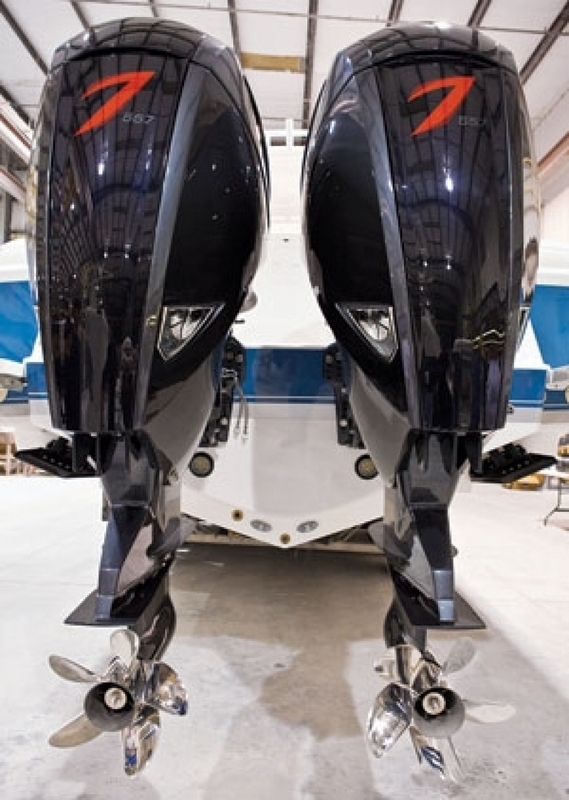 He has been approached by Seven marine to re-power from his three, three hundreds to use their new 557 hp engines. Yes I did get that right 557 hp you can check the motors out at www.seven-marine.comthey are awesome. Basically they are 6.2 litre Cadillac V8 and are all aluminium and are supercharged, just out of this world. As you must have gathered from my blogs I was left numbed from my day out in the old 900 hp boat and yes I have been invited out in the new one if he re-powers. Looking and listening to reports on the web they are not all just about they power and are very very smooth one guy said just like a freight train endless power. The only problem Capt Ron could see is that they have not been out long and he can not afford break downs but he is very, very tempted. Comments Off on Just how big can you go ? I have found a new product to me anyway called Rod Wrap a tape to bring new life and improve rod handles. 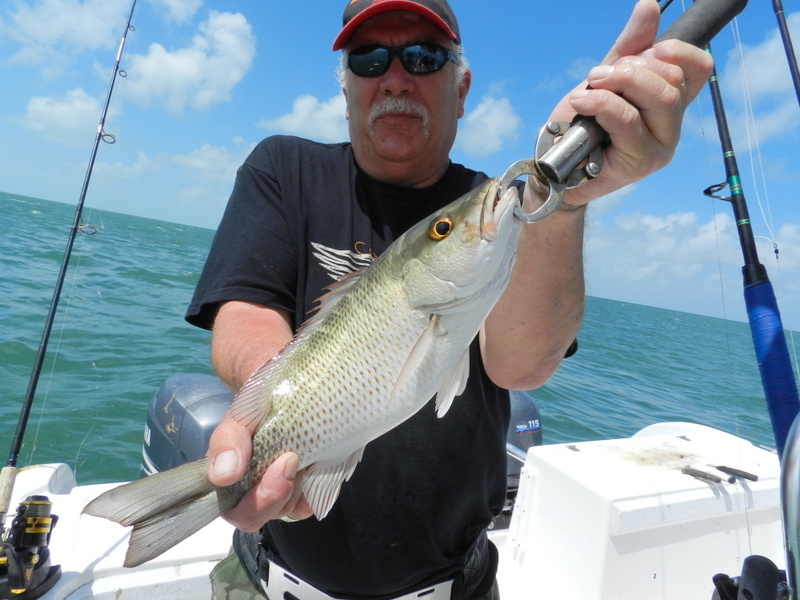 The one main problem I have found is that large rod handles tend to attract fish hooks and when as we do in the Florida Keys use large hooks up to 22/0 they do leave their mark on handles. This tape sticks to its self and gives a slightly tacky feel even when wet and seems to be lasting very well with our big fish abuse. I am not sure if anyone sells it in the UK I do know that Bass Pro stock it and as many of you know they will mail order to the UK no problem. Certainly it is a lot easier to use this tape than rebuild a cork handle and by using a big overlap you end up with a larger diameter handle. Neat stuff or what just what the Americans are good at making stuff we need. Less than six weeks ! 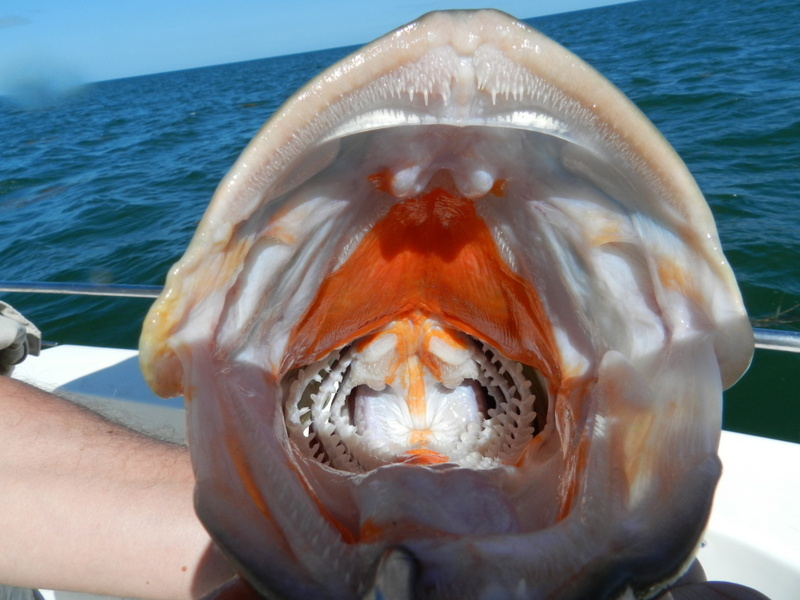 Not sure why so many fish in the Florida Keys have such brightly coloured mouths may be one of you out there knows please email the red grouper is no exception but there are many more. Robs week was on of the toughest for wind I have known for a long time but we fished every day and had fish over 200 lbs we are so lucky in the Florida Keys that we can. 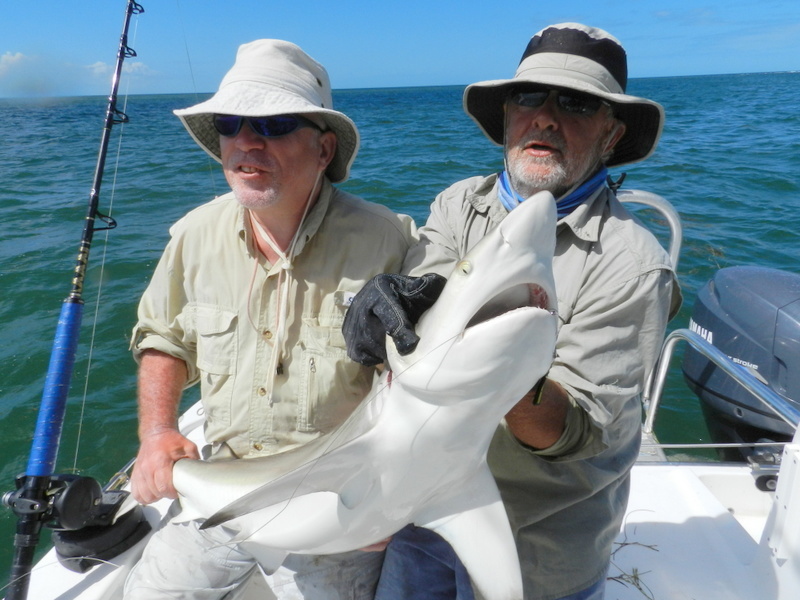 Nigel signed off the week with a fine blacktip not a monster but the power even this 40 lb fish had is hard to believe. This was Rob and the boys sixth trip and I have to say one I always look forwards to they are a great bunch of guys to fish with. Comments Off on Less than six weeks ! 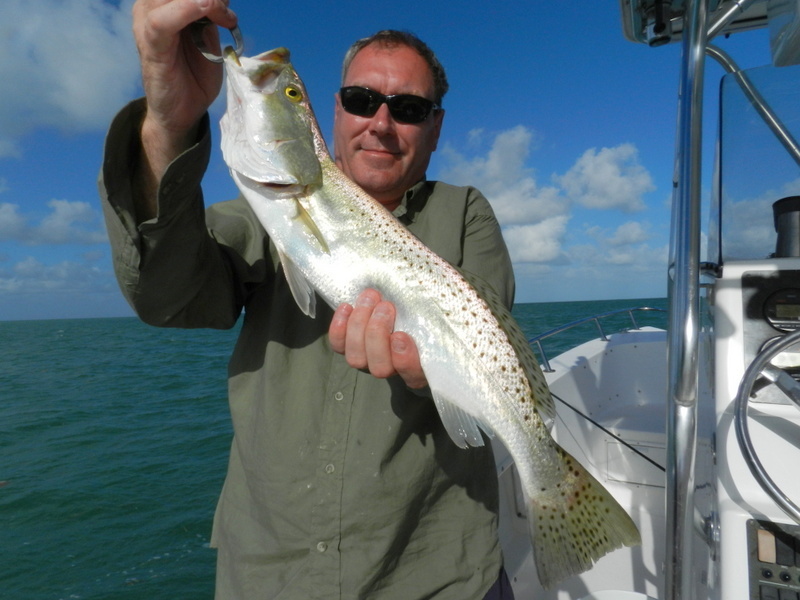 One of the most successful conservation stories in the Florida Keys has been our spotted seatrout. Their numbers had been getting low so a tough policy was adopted, a closed season so all spawning fish were released, and a slot size for keepers. It was this slot size that had the greatest benefit all fish under 15 in went back as did all fish over 20 in. The exception is that you can keep just one big fish over 20 in so that fish of a life time can be kept but only one per day meaning all other big fish, all females, have to go back. Well it has worked so well that as from this year the closed season is over and you can now keep trout all year. This slot management of fish stocks works so well over here it is such a shame so many big spawn bearing female bass are kept in the UK. In fact it is the releasing of the big fish they have found over here is far more important than the killing of small usually male fish. Back to this weeks fishing holiday with strong winds all week we have had to find shelter and fish where we can. 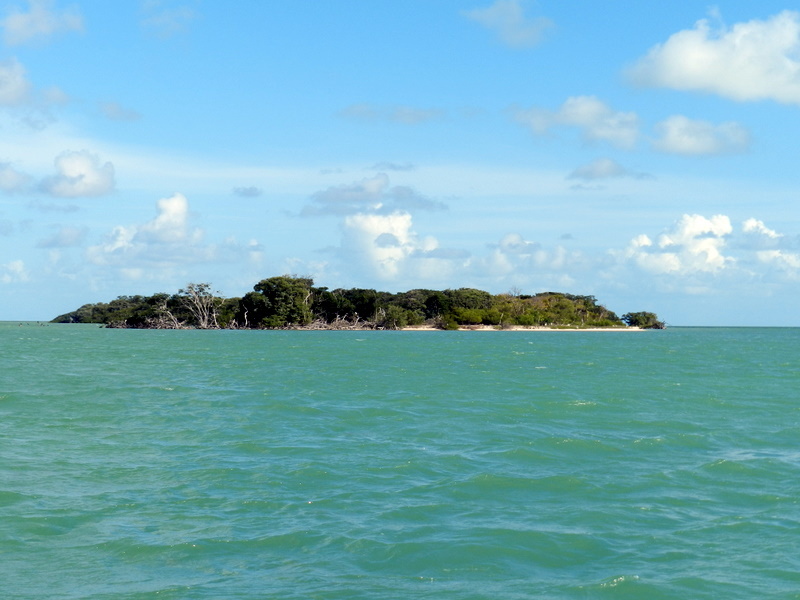 Some 20 miles north of our base are two classic desert islands Sandy Key and Russell Key both giving lots of shelter and trout and lady fish. Yesterday with the strong wind still blowing the plan was to go to the islands with a quick stop on the wreck to give two guys a goliath grouper on the way. Far from pretty on the wreck but Rob had a one just under a 100lb and Nigel had one about 120lb so first part done. Much nicer water on the lee of the islands and fish a plenty, hard fighting trout and lady fish. Rob was working soft plastics and the rest of the crew shrimp till they ran out of bait but Gulp came to the rescue and the fish kept coming. So all in all the plan came together again and well all had some tasty trout for tea.